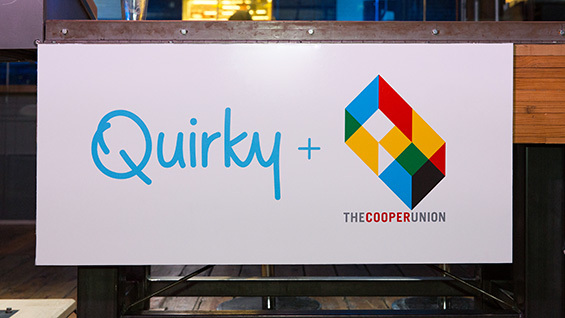 Four inventions created and prototyped by Cooper Union engineering students have been chosen to be further developed by Quirky, a company that refines and markets new inventions. “We’ll research, brainstorm, design and style your idea into a shiny reality,” the company writes in its congratulatory letter to the students. The eight students designed their products last year as part of the Invention Factory, a six-week intensive summer program where students learned the basics of researching, designing, prototyping and presenting a new invention. "It’s a fantastic opportunity and the perfect fit for our students,” says Alan Wolf, professor of physics and a patent attorney who runs Invention Factory with Eric Lima, associate professor of mechanical engineering. “Not every student will want to make that right-angle turn from technical work to business plans, raising funds, etc. The Quirky model of taking over the development of the product and generously sharing profits with inventors allows Cooper students to become what I call 'serial inventors.' They can quickly move on to their next invention and/or focus on school work." 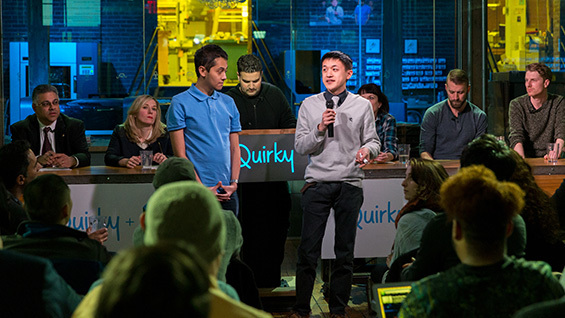 On February 19th Quirky dedicated its weekly live-streaming "eval" session exclusively to reviewing eight inventions created by 15 students who participated in the 2014 Invention Factory. Part game show, part business evaluation -- think Shark Tank with online voting -- the event gave the students a chance to pitch their inventions to a panel of judges, audience members and the world at large, who could vote online in real time. Four of the eight inventions presented were "upvoted" for further development as Quirky products. See the highlights. The four inventions selected include the Dual-Flush Retrofit Kit by Eric Nguyen and Abiyaz Chowdhury, designed to easily convert a standard toilet into a water-saving dual-flush system. It took the top prize at the 2014 Invention Factory. Last year's second-place winners Deanna Kovalcin and Jessica Marshall saw Snip-It, their universal tape dispenser, also get “upvoted." The other two selected inventions were ETCH, an easy-to-clean humidifier created by Jihu Kim and Min Joon So, and the Helmet Lock by Ryan Yun and Tony Lau that conflates a bike helmet and bike lock into one device. 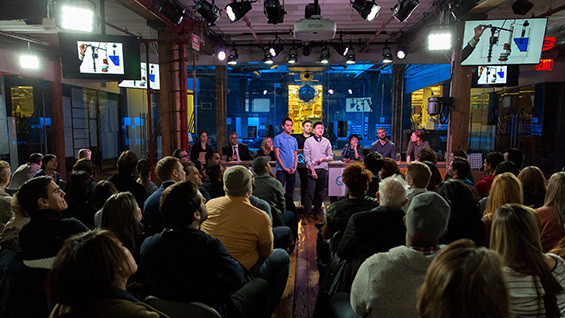 Students presented their ideas to the audience of about 80 people inside the Quirky studio, located in the Chelsea neighborhood of Manhattan. Each presentation started with a video explaining and demonstrating the product. All of the videos can be found at inventionfactory.org. 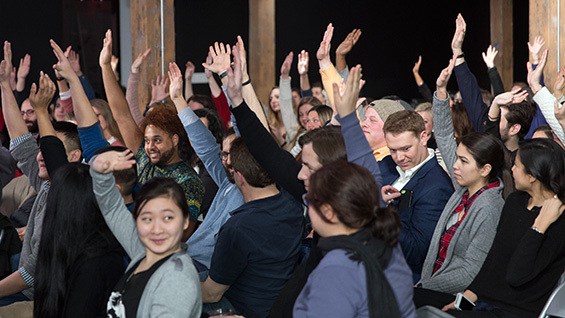 After the video the students fielded questions from the audience, webcast viewers, and a panel of expert inventors and designers who weighed in on the originality and potential market value of the products. 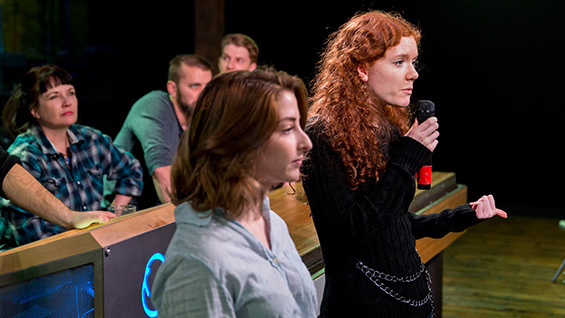 Aggressive questioning forced students to agilely defend their design choices, a skill honed by the Invention Factory process of regularly presenting prototypes to designers, attorneys, alumni and students throughout the six-week program. One of the judges noted that the Dual-Flush Retrofit Kit, which works by being almost literally dropped into a toilet tank, was similar to one sold at Home Depot. Eric Nguyen calmly noted that they knew of the competing product and that it was in fact much more difficult to install. The installation video was called up, proving him right. The team's invention quickly moved on to the next phase.